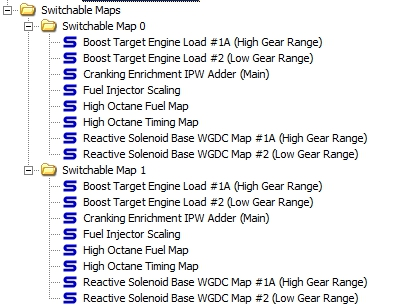 By properly blending load based on unique MAF and MAP sensor calculations, the newest Beta AccessTUNER allows your Evo X to perform better than ever. This enhanced understanding of the tuning logic is accompanied by an all new tuning guide, 2-way on the fly map switching, CEL knock flashing, and Mode23 data logging. To update, open AccessTUNER, click Help, Check for Updates, and check the Beta box. The Updated Tuning Guide, v300 includes the latest tuning strategies, table additions, and monitor updates. Not only is it a great Saturday afternoon read, but it is the best way to learn about the new tuning strategies from the engineers who have spent months researching the optimal way to tune these vehicles. Just open AccessTUNER, click Help, then Help again. The Refined Load Calculation Strategy utilizes newly exposed tuning tables to fine tune the MAF and MAP systems using the OEM strategies. The new tuning strategy laid out in the all new Tuning Guide eliminates SST shifting issues, jagged timing curves, inconsistent fueling, poor idle with aftermarket intakes, and false knock events. Mode23 Data Logging enables factory data logging commands for additional data channels and the ability to use alternate logging software. To use Mode23 Logging, just save your current or new map file in the latest version of Beta AccessTUNER and then reflash it to your vehicle. CEL Knock Flashing can be enabled using the new CEL Knock tables in beta AccessTUNER. These fully adjustable tables allow you to have the CEL on the dash flash at different speeds under knock conditions. A quick and simple way to help monitor the health of your car without needing additional gauges. 2-Way Map Switching allows you to pre-load two finely tuned maps and and quickly switch between them using configurable switching options such as TPS based switching or Cruise Control based switching. This is a great option for performance/economy map or pump gas/E85 map combinations. After a simple Beta Firmware update using AP Manager, your AccessPORT will be able to take full advantage of new Data Monitors. • “Active Map” – Current active switchable map, distinguishing between the two potential map slots. • “Load Ref. Calc” – A blended version of Calculated Load based on MAF/MAP sensor calculations. • “MAF Calcs” – Load calculations based from MAF sensor input. • “MAP Calcs” – Load calculations based from MAP sensor input. • “Tip In Transient” – A derivative of throttle position during engagement of the accelerator pedal. • “Tip Out Transient” – A derivative of throttle position during disengagement of the accelerator pedal. • “WB AEM AFR” – Wideband AFR using an AEM UEGO WBo2 wired into the rear O2 harness.